The second in my on-going affair with independent comics, Lilith Dark had few hurdles to overcome. The concept of a brave little girl getting her swashbuckle on raises a lot of red flags in my mind. The traditional narrative of these stories has lately given way to the same stronk wimmin who don’t need no may-an! message fiction that serves as kryptonite to well-adjusted readers. I’m happy to report that Lilith Dark, written and illustrated by Charles Dowd, doesn’t fall into any of the usual traps. Lilith is a normal little girl with an outsized imagination. Her bravery smacks more of foolishness and naivete than trust in the guiding hand of plot immunity. Her brother and sister are presented as annoyances – it is told from Lilith’s point-of-view, so this is a natural – but when push comes to shove, both prove to be as loyal and brave as their titular sister. Lilith’s brother in particular bears the burden of ‘token cowardly boy’ that has become a prerequisite for modern storytelling, but never sinks to that level of cliché. Instead, given the first opportunity to do so, he hitches his belt up and heroically strides into danger to save his younger sister. His bravery proves unnecessary as the threat in his mind was greater than the threat in reality, but his ability to rise to the challenge serves as a useful example of how Lilith Dark avoids the pitfalls that snare so many comics creators these days. The artwork is a bit cartoony, appropriately so given the target audience, and adds to the fairy tale nature of the thing. Dowd’s illustrations stay well away from the flat and lazy artwork that seems to be all the rage these days and yes I’m looking at you, CalArts. The pacing, characters, and threats in this story make for a perfect introduction to comic books for the younger set. I read Lilith Dark in part through the eyes of my own five-year-old daughter, who laughed along with Lilith’s adventures and appreciated her bravery. 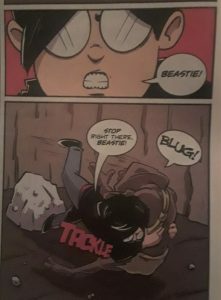 The ‘beasties’ in the story might have claws and sharp teeth, but they bring just the right amount of menace to thrill the younger set with the right amount of slapstick to ensure they don’t wake up in the middle of the night. Though a little too childish for readers in the tween and older brackets, parents can rest easy knowing Lilith Dark hits the sweet spot for that four to eight-year-old range. Now I’ve got to see if Mother Russia can make this a hat trick for Alterna.